Too Close To Home combines believable characters with romance, suspense and faith to create a story that you'll struggle to put down. This story is tailor made for fans of crime fiction TV shows such as CSI, Bones, NCIS and also fans of romantic suspense and fast paced crime novels. Book One in Lynette Eason's 'Women of Courage' crime suspense romance series sees Samantha Cash, the FBI's secret weapon, assigned to help local chief of police, Connor Wolfe, find a killer. Samantha is a woman in man's world, but she is as relentless as any man in the pursuit of justice. Her methods are invisible, and she never holds back until the case is closed. When missing teens begin turning up dead in a small Southern town, Samantha faces more problems than those of the baffling case: there's her faith in God, and her faith in herself. Too Close To Home by Lynette Eason was published by Baker in May 2010 and is our 15222nd best seller. The ISBN for Too Close To Home is 9780800733698. Take a peek at some articles related to Too Close To Home. Got a question? No problem! Just click here to ask us about Too Close To Home. 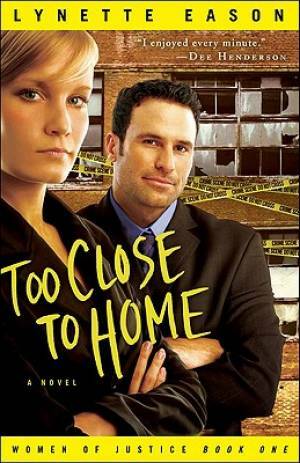 From Lynette Eason comes Too Close To Home, a fast paced crime fiction novel filled with non-stop action. This fast moving crime fiction novel is the story of Samantha Cash, the FBI's secret weapon. Her methods are invisible, and she is relentless until the case is closed. When the bodies of missing teens begin turning up in a small Southern town, Samantha is called in to assist local chief Connor Wolfe in his investigation. But Wolfe has two problems with that. There's her faith - in God and herself. And then there's her uncanny resemblance to his late wife. As they get close to finding the murderer, the case becomes personal. The killer seems to be taking an interest in Connor's 16-year-old daughter, who believes her dad is becoming over-protective. The town demands answers, and Connor is running out of ideas, and time. In Too Close to Home, Lynette Eason cranks up the suspense even as love blossoms in the face of danger. Too Close To Home combines lovable characters with elements of romance, suspense and faith and creates a book that readers will struggle to put down. This story is perfect for fans of crime fiction TV shows such as CSI, Bones and NCIS and also fans of romantic suspense and fast paced crime novels.